We recently completed a fun and fulfilling project in the Colonial Heights neighborhood in Sacramento. We worked with homeowners Tom and Rosette, who for many years lived next-door to a vacant lot. The lot was overgrown with weeds, and received a lot of traffic from people looking for a hidden spot to go to at night. Tom and Rosette purchased the lot with the aim of transforming it into a safe space for the community to gather, grow food, and host after-school programs. The project had a number of conceptual challenges. First was the goal of creating two types of spaces. 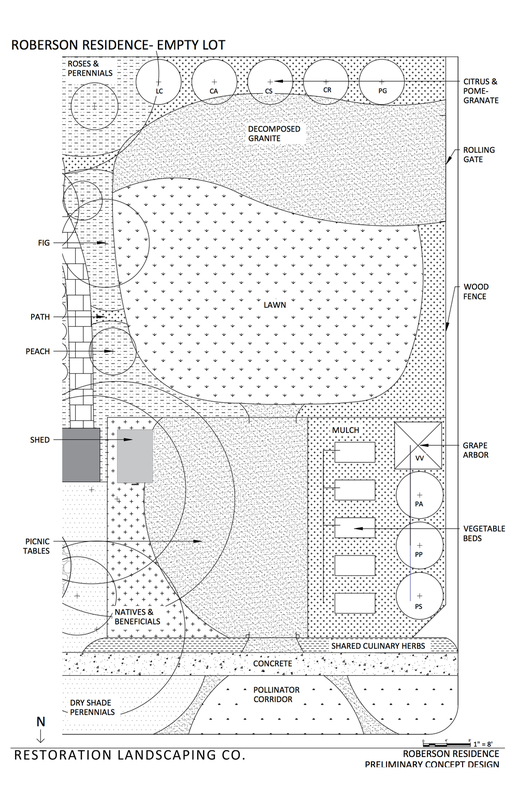 One would be entirely public and open visually, and include raised veggie beds for community members to use. This space would be locked for safety purposes but participating community members would get a key to use for access. The second part of the space would connect directly to Tom and Rosette's back yard, and be used for hosting large events. The two spaces connect via a large gate that opens up. Plants are predominately fruit trees and bushes, and there are some natives planted as well. We used natives that provide natural pest control for the edible plants - sticky plants like hummingbird sage that capture small flies to feed predatory insects, and plants like CA woodmint that are natural hosts of predatory insects like plant bugs and stilt bugs. We are waiting for the city to repair the sidewalk before we plant native plants as part of a pollinator corridor. These plants will provide habitat for native pollinators and allow youngsters in the neighborhood a chance to learn about conservation and ecology, which are great ways to connect with biology and science more broadly. Newer Post2nd Prison Garden Installed!